It’s spring time, and if your garden is anything like mine, it’s overflowing with zucchini. If you don’t have a garden, you may have noticed your local grocery market is beginning to carry bigger, greener and more beautiful zucchini than it has all season. Springtime brings with it fresher greens, juicier berries and more locally farmed produce, making this season a favorite for many culinary enthusiasts. If you haven’t already, I highly recommend checking out your local farmer’s market. Not only can you find some great produce at a better price than a chain grocery store, you’ll also be supporting your local farmers, which in turn supports your local economy. Naturally, I’m on the hunt for more recipes to use these delicious morsels, and zucchini is one of my favorite vegetables. So, let’s get right down to it. 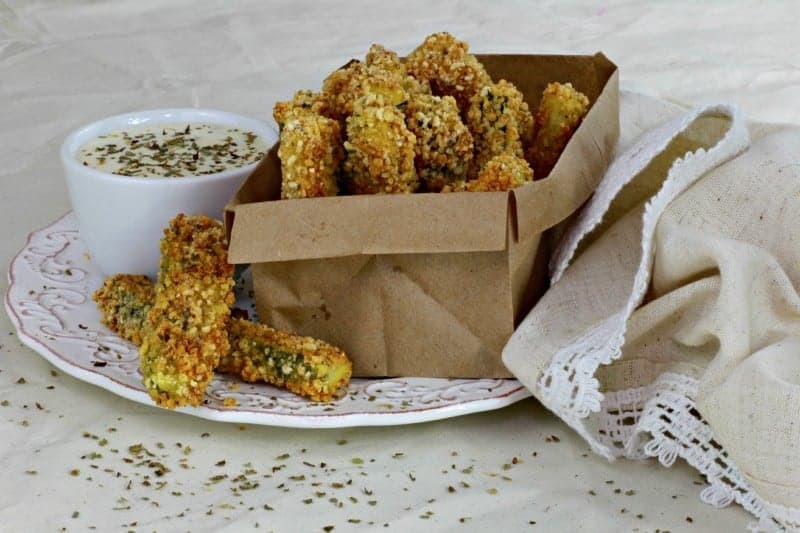 Zucchini fries has got to be one of my favorite ways to enjoy zucchini, and I’m betting it will become one of yours, too. 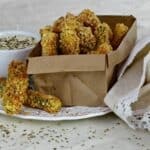 For this Zucchini Fries recipe, I used 4c gluten-free breadcrumbs in the pictures above, but if you’re not gluten-free then you can use your own favorite brand of breadcrumbs and they will still turn out great. You’ll want to give them enough space on the pan to crisp around the sides. Don’t lay them too close to each other, or they may not reach their full crispy potential. Technically, you could throw these right into a pan of frying oil. …If you really want to. But I think baking not only adds fewer calories (keeping the zucchini, you know, still kind of healthy), it’s also a lot easier. You don’t have to stand over the oil watching them, and they’re all done at the same time. But you can technically fry them. And without further adieu, I give you the Zucchini Fries recipe. 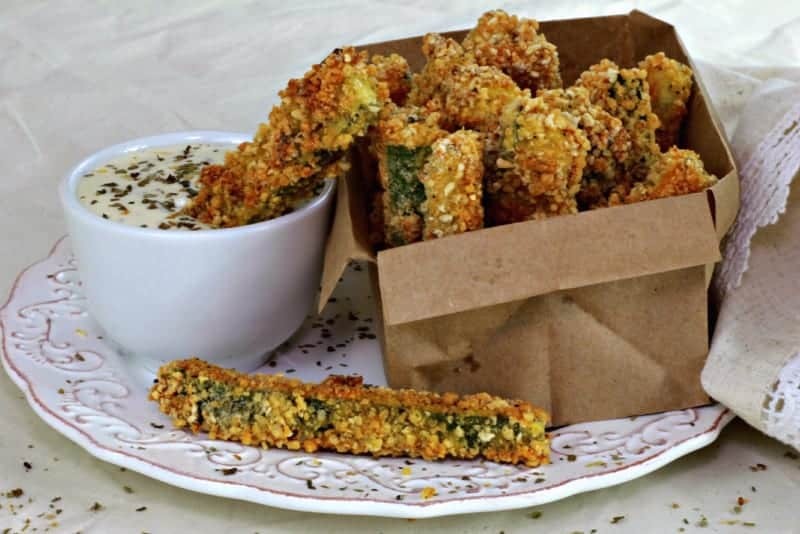 These crispy, delicious zucchini fries are a great way to enjoy your garden vegetables. You can use pre-seasoned breadcrumbs, or add your own unique seasoning to plain breadcrumbs. This recipe is also great when using gluten free breadcrumbs. Preheat oven to 425°F. Grease a baking sheet and place aside. Trim ends off zucchini and discard. Cut zucchini in half, then into strips, about 1/2-inch thick each. Add eggs and milk to bowl and whisk until combined. In a separate bowl, add breadcrumbs, garlic, salt and pepper and stir together to combine. 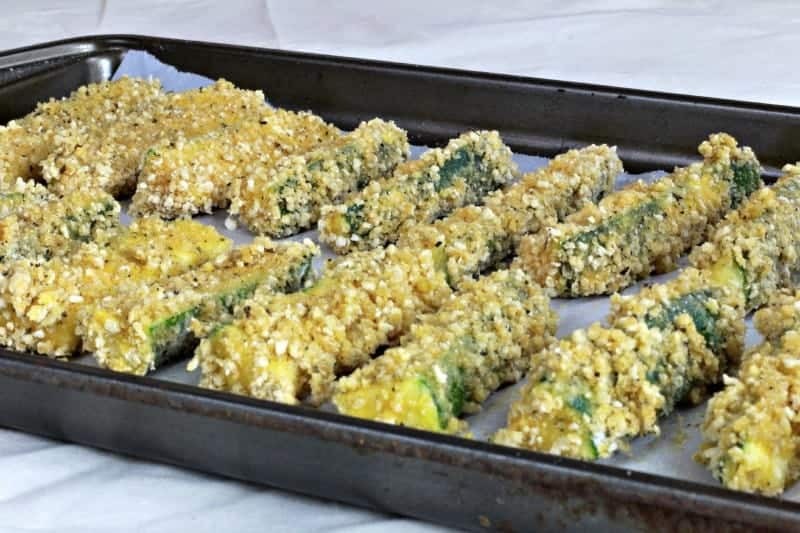 Take each zucchini strip and dip into egg mixture, coating strip entirely. Then roll in breadcrumbs until evenly coated and place onto baking sheet. Repeat until all strips are coated. Spray breaded zucchini with cooking spray lightly, making sure to get all pieces. Bake for 20-25 minutes, or until golden brown and crispy. Looks good! I’m going to try them tonight. Can you recommend a dipping sauce? What is the sauce that is pictured? Hi Todd! In the picture I used Ranch dressing (which tasted pretty good if you like Ranch, but it’s what I had in my refrigerator at the time). I would recommend a warm marinara sauce, too. Or, if you’re feeling particularly adventurous, these would go great with the garlic aioli dipping sauce from my sweet potato fries recipe. Thanks Jacqui! I’m going to give that garlic aioli sauce a shot.